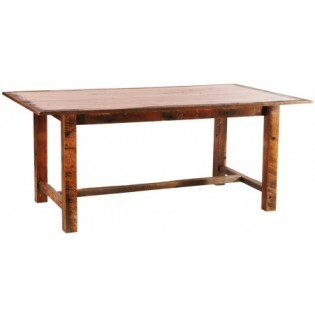 Modest gathering or extra large crowd this rustic farmhouse dining table is sturdy and built to be used. It is made from reclaimed Red Oak planks from 1800's tobacco barns. Barnwood Farmhouse Dining Tables. Modest gathering or extra large crowd this rustic farmhouse dining table is sturdy and built to be used. It is made from reclaimed Red Oak planks from 1800's tobacco barns. Each individually hand crafted table features a dull catalyzed lacquer finish that is extra durable and retains the wood's natural character. This rustic farmhouse table will add rustic charm to your western or lodge decor.